It is important to keep in mind when studying ancient people and places that dates are oftentimes points of contention among the particular scholars of that topic. One just needs to do slight research to see that dates from one archaeologist may vary by hundreds, or even thousands of years from another archaeologist. Jericho is a perfect example. In part, this is due to the improved dating technology from one excavation to the next, yet, this is not always the case. It is not the intention of this site to offer dates as exact dates when they are in contention. Rather, the different dates are used to encourage one to form his/her own opinion, when viewed in context with archaeological finds, the Biblical record and other resources. Jericho fits this category. Kathleen Kenyon is recognized as one of the top experts on ancient Jericho. Her findings reveal the city was inhabited during four consecutive periods throughout the Epipaleolithic and Neolithic (the two ages overlap) Age. It has been suggested that even at this early date, the racial makeup of these people were completely mixed. Despite the controversy of dating some events, it is widely agreed upon that by 7500 B.C. 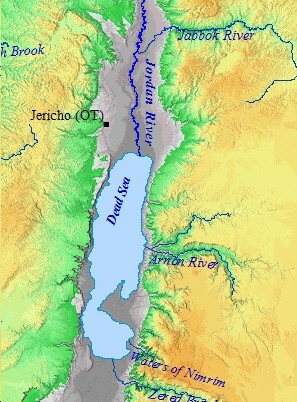 ancient Jericho was firmly established in the Jordan River valley. The ancient site of this time covered 6 acres, and was heavily fortified by a wall with immense round towers made of stone. Jericho's economy was in a transition from one of gathering food, to an economy of producing food. The earliest inhabitants are known as the An -Natifiyyun. These people relied on gathering wild seeds for food. It is unlikely that they planted these seeds, but rather harvested them using tools. These tools included scythes with flint edges and straight bone handles. They used stone mortars with handles to grind the seeds. Some of the An-Natifiyyun lived in nearby caves. Others lived in primitive villages, excelling in architecture. Over the course of time they learned how to make sun-dried bricks, and began to build more substantial dwellings. These dwellings were round huts, constructed from flat-bottomed bricks which curved at the higher edge. Canals were dug from ancient Jericho to the nearby Ein Al-Sultan spring. These canals provided ample supplies of water for residential use. As their economy progressed, they used these canals to irrigate their fields. They constructed walls 6.56 feet (2m) in width to surround and enclose their villages. Within these walls they erected a massive tower, 29.53 feet (9m) in diameter, and 32.1 feet (10m) in height. A staircase lead from the top of the tower to the town below. These ruins are some of ancient Jericho's oldest ruins. The walls predate the Egyptian pyramids by 4,000 years. The staircase is the oldest known staircase in the world. 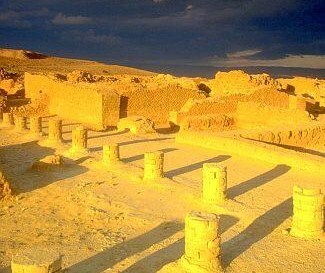 They make ancient Jericho the oldest fortified city in history. As the An-Natifiyyun progressed, they diversified their economy. Agriculture was still the mainstay of the way of life in ancient Jericho. However, they also domesticated animals, made chains and mats through early weaving methods, and hunted animals with spears and flint-capped arrows. Hatchets used for cutting down tree branches have also been uncovered. As their technology improved, groups began leaving old settlements behind in an effort to expand their boundaries through new villages. The construction of houses in this period show tremendous progress from the previous age. Stone was used to lay the foundation, and the rest of the building was constructed of sun-dried brick. These bricks, however, were rectangular in shape with sharpened edges. The floor was made of a mud layer topped by a layer of lime. On top of this, they put a layer of soft lime, either dyed red or light blue, then polished the floor to attain a new gleam. The houses of this time varied in size, some standing at one story, others were two stories. The smaller "apartments" had rooms which measured 9.84 ft. (3m) by 22.97 ft. (7m). The larger dwellings had rooms which stood 21.3 ft (6.5m) by 16.4 ft. (5m). The houses were typically rectangular in shape, built around an open yard. The yard was 22.97 ft. long by 22.97 ft. wide, and was used for cooking. The walls were just over a foot and a half thick (1/2m). The ceilings were made of reeds and mud. Small statues were created using sun-baked mud, and these possessed a religious implication. Fertility goddess worship may be indicated by female statues. Archaeological finds have found evidence of ancestor worship as well. Nine skulls were found with painted faces, using lime, and two mother-of-pearls placed on the faces of each skull. SHARE YOUR THOUGHTS ON JERICHO. Did you know Jericho was such an ancient city? Have you ever visited, or lived, in Jericho? Click on the above link to give us your insights, thoughts, comments, and questions! These ruins from Jericho are walls that some have dated to 1400 BC. Though a controversial topic, these people claim these may be the walls Joshua and the Israelites tore down on their way into Canaan. These walls from Jericho have been dated differently by John Garstang and Kathleen Kenyon, the two foremost archaeologists to study Jericho. The people living in ancient Jericho during this period of time, according to Kenyon, were marauders from the outside realms. These people may have been nomadic Bedouin. They settled at Tell es-Sultan, and even though no remains of their homes have been found, digs have produced looms, jasper beads and mother-of-pearls dating from this era. Special vaults were used to bury their dead in groups. Skulls of prominent men were kept in mausoleums. Their remains have been closely studied, and have shown that the average lifespan of males from this period was 35. Some males reached 50, but this was rare. During the early part of this period people lived in pits, and relied on agriculture and domestication of animals. Primitive and rough pottery has been found dating back to 4500 B.C. They used this pottery in the construction of their homes. As time progressed people became much more advanced and sophisticated. They lived in clay huts and manufactured much more sophisticated forms of pottery. Their settlements and villages were enclosed in massive walls, and perhaps housed as many as 2,000 residents. 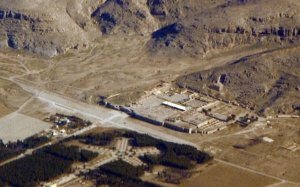 No evidence of ancient Jericho being inhabited at this time exists. Archaeologists point to two discoveries to support this theory. One of these discoveries is of a disintegrated layer of organic matter accrued on the Tell from this period, signifying the absence of activity in and around the city. Also, no remains have been discovered from this time. Discoveries from other sites reveal metal was used for the first time during this period. Author Rafael Ruppin dives into some of the most captivating and intriguing documents ever unearthed! Amazon.com presents The Jericho Scrolls. These 1,900 year old recollections of Julius Antigonos, a Roman Knight and Jewish Leader, shed invaluable light on the history of Israel. These documents were found buried in a leaden chest and sealed with tar from the Dead Sea. The Jericho Scrolls are a must have for fans of the ancient Near East! Click on the link below to re-direct to Amazon.com and view The Jericho Scrolls! Beginning between 3200 B.C. - 3000 B.C., several large, and heavily fortified towns appeared in ancient Jericho alongside the villages. These towns appeared mostly along the coastal plains, or in the great valleys, wherever water was most abundant. Ample water supplies, and fertile land, led to the development of these huge cities, with walls up to 30 feet thick. Habitation resumed round 3200 B.C. Tombs have been uncovered in and around Jericho from this time which suggest strange burial customs and practices. One grave, in particular, dates back to 3260 B.C. One hundred and thirteen skulls were found in this grave, arranged around the chamber of the tomb. At the center rested a mound of burnt bones. Some skulls contained evidence of scorching, but not burning. Archaeologists use this scorching, rather than the typical burning, to indicate strange and methodical practices associated with burial. Reconstructions of this grave indicate that the bodies of the dead were first placed in the open, and allowed to decompose until the flesh separated itself from the bones. The skeletons were then gathered together; the skulls arranged symmetrically around the chamber, with the faces pointing inside. The rest of the bones were placed in a mound, in the center of the room, and then set on fire. When the heap of bones cooled down, the funeral offerings were then made, and placed in the grave. Stone chips were then placed on top of the burnt bones. This grave is unique in ancient Jericho when compared to other sites from the same time in Palestine and Trans-Jordan. Little else is known of these people. The EB II period saw much prosperity and advancement in Palestine and Trans-Jordan. In ancient Jericho, solid and sizable houses were built. A sanctuary was also built, similar to others found in Megiddo and Ai. These structures were enveloped within a defense wall built around the city. Jericho, as did the other cities in Palestine, possessed immense and massive fortifications. The steep roads from Jericho into the Hill Country of Canaan. It was Joshua's entry point. THE HILL COUNTRY OF ISRAEL. ANCIENT ISRAEL POSSESSED THE HILL COUNTRY, DESPITE REPEATED EFFORTS BY THE PHILISTINES & OTHERS TO DRIVE THEM FROM THEIR STRONGHOLDS. Politically, Palestine, more properly known as Canaan, was a collection of independent city states at this time, with each city under the control of one King. The presence of massive defense walls suggests that these independent city-state Kings frequently attacked each other. The walls of Jericho from this time attest to that theory. Over the course of a 600 year period, beginning around 2900 B.C.E., the walls of Jericho were rebuilt sixteen times. Invaders are not the only cause of this, as earthquakes, water in the foundations and other natural causes played a role in the constant maintenance of the city defense structures. However, outside attackers frequently raided the city. Evidence of fire and destruction are evident among the ruins and remains of Jericho and its walls. Evidence of repair and rebuilding are present as well. The people of this time, though flourishing technologically and culturally, led a life of very little peace and much instability. Despite the frequent fighting among the city-states, Jericho shows signs of a highly cultured and urbanized center. Pottery utensils point to an extensive trade network Jericho had set up with its neighbors. Objects from Egypt and Mesopotamia prove an international trade existed. The presence of other urbanized centers in Megiddo and Ai point to the cultural and social advancements that took place throughout Palestine in this era. The spectacular remains of King Herod's palace in Jericho. This prosperity, however, was about to come to an abrupt end. Bedouin raiders swept through ancient Jericho destroying everything in their paths. Walls dating back to this period show hasty and careless construction, almost as if they were caught by surprise and attempted to repair, or erect, defense walls which had been previously neglected. Perhaps the prosperity led to complacency. Whatever the cause, these Bedouin raiders were swift and destructive. Jericho fell into the hands of these Bedouin raiders. Not much is known about ancient Jericho from 2700 B.C. to 2400 B.C. However, between 2400 B.C., and 2000 B.C., a dramatic reduction of settlements occurred in Cannan. Almost every site was either abandoned totally, or settled on a reduced scale, and Jericho was no exception. Archaeologists point to a number of factors. A climate change occurred, which produced far drier conditions than earlier. The result was a severe recession in agriculture. Domesticated animals lived on the very bare necessities, as good grazing land became hard to find. Bedouin invaders took advantage of the lack of serious defense structures, as noted above, and raided villages and cities frequently. The archaeology and dates of ancient Jericho coms into question due in large part to the debates surrounding its role in the Exodus and Conquest by Israel. Chronologies vary widely as to the Exodus and Conquest by Joshua and the Israelites. Central to this problem is the dating of their arrival in ancient Jericho. For every archaeologist that claims Jericho's remains do not match the Biblical account, there is another one who either claims it does, or offers a different chronology. 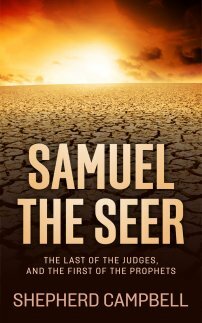 Serious scholars and historians place the Exodus and the conquest of Joshua in either the fifteenth century B.C., or the thirteenth century B.C. Neither date can be proven with absolute certainty. The first step in any attempt to correlate the Bible with dates, is to begin with the account of the subject in question. Are You an Archaeologist? Student of the Bible? Lover of History? Jericho is a hotly debated topic amongst archaeologists and Biblical scholars. What are your thoughts, questions, opinions regarding Jericho and the archaeology behind this ancient city? Have you visited Jericho? Post your pictures here as well! Then click on the link if you want to upload up to 3 more images. All images must be in .jpg or .gif format.